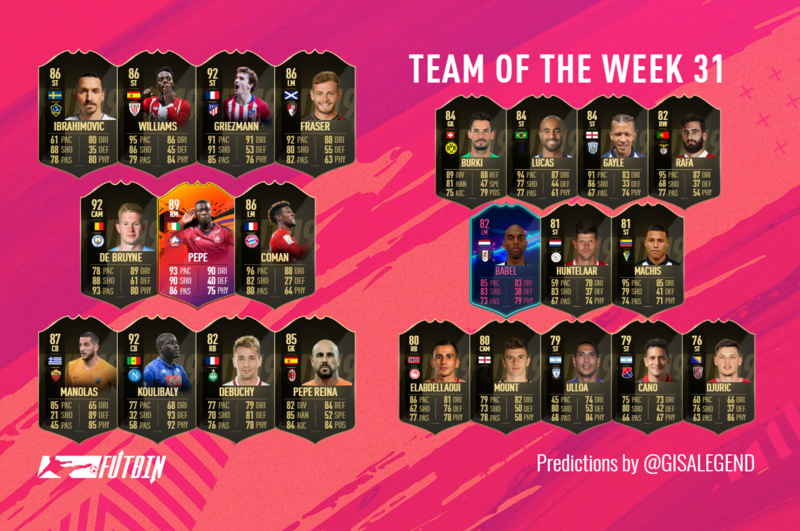 TOTW31 looks to have the potential to be a good TOTW depending on your team and going on a number of individual performances, it will be interesting to see who misses out this week especially in the higher rated cards that have stood out. The big question is which of the elite cards will miss out as Ibrahimovic, Griezmann, De Bruyne are 3 talking points, but also Pogba, Manolas & Oblak 3 others are to keep in mind with this too, but let's see who makes TOTW31. Pepe Reina - GK - OVR 83 Reina stepped in for Donnarumma this week, putting an impressive shift in, earning a 7 from Gazzetta and 5 saves plus a clean sheet into the bargain, as a result done enough surely to get in. Kalidou Koulibaly - CB - OVR 88 Napoli kept the title race going for another week, with a 3-1 win, Koulibaly looking set for another special card after 2 goals from him as well he gets a spot. Mathieu Debuchy - RB - OVR 78 St Etienne keeping the form up in France, Debuchy played a big part with 2 goals from RB, keeping a clean sheet helps too. Kostas Manolas - CB - OVR 85 This one is in the punt category, Manolas kept a clean sheet and got a 7 from Gazzetta, while Roma won through Dzeko's goal, with the lack of stand-out defenders and options from Serie A this week, he gets in. Ryan Fraser - LM - OVR 77 Fraser continues to show his form this season that looks set for a TOTS Card, but in the meantime another IF is set, after his 1 goal and 2 assists, Wilson is the alternative but Fraser is our choice. Kevin De Bruyne- CM - OVR 91 A first IF looks set for De Bruyne after his 2 assists in their win over Crystal Palace, with the importance of the win too, this could be set. Nicolas Pepe - RM - OVR 79 Pepe ran the show against PSG, keeping the title race going for another week with a 5-1 win, Pepe got 1 goal and 2 assists in the game, making him stand out even more come TOTS, the only downside that may go against is, he got an IF a few weeks back at TOTW26 so could go to someone else in this game but doubt it. Kingsley Coman - LM - OVR 83 Bayern showing more ruthless form, this week against Dusseldorf, Coman made TOTW and got 2 goals, alternatives are Gnabry and Kimmich but feel Coman is best due to his 2 goals. Zlatan Ibrahimovic - ST - OVR 85 Ibrahimovic shown ample form of late and another 2 goals for him, surely has him bagging an IF this time, as can't keep avoiding all the time, this week looks it at last. Inaki Williams - ST - OVR 81 Bilbao keeping their form up and Williams played a big part with 2 goals and a 3 from Marca, this SIF could be quite an appealing super-sub red pick come Thursday. Antoine Griezmann - ST - OVR 89 Atletico looked a class apart this weekend and Oblak/Griezmann both standing out earning 3s from Marca, while Oblak only made 3 saves, which we feel may not be enough to earn his spot, despite missing out last week, we've opted for Griezmann for 1 goal and 1 assist, which could do enough to earn a spot. Roman Burki - GK - OVR 81 Dortmund needed to bounce back after their loss to Bayern & did so in a 2-1 win against Mainz, Burki made 8 Saves in the game, while Sancho got the 2 goals to win the game, both made Kicker's TOTW and 1 should make the cut, we've opted for Burki. Lucas - ST - OVR 82 Lucas played striker for Spurs with Kane injured, he ran riot against Huddersfield scoring a hat-trick doing enough to get into the TOTW. Dwight Gayle - ST - OVR 75 Gayle has made the Championship a level he's comfortable at with any team and a SIF looks set for him after a hat-trick for him, making championship cards a bit more appealing alongside POTY Pukki & Aarons. Rafa - RM - OVR 79 Benfica showing impressive form at all levels, while Seferovic, Pizzi & Joao Felix 3 standouts this season, Rafa has played well too, this week bagging 2 goals and 1 assist to seal his spot. Ryan Babel - LM - OVR 79 Fulham may be down but keeping up some fight, after a win against Everton, Babel being the stand-out with 1 goal and 1 assist, due to his OTW card, that could play a factor too in him getting an IF, but he has deserved it regardless. Klaas-Jan Huntelaar - ST- OVR 77 Huntelaar rolling back the years with a POTW performance with 3 goals and 1 assist sealing a spot in the TOTW. Darwin Machis - ST - OVR 75 Cadiz keeping pressure on playoff spots in La Liga 123, with Machis playing striker scoring a hat-trick, his gold weighting should help too. Omar Elabdellaoui - RB- OVR 74 Guilherme may have got 2 goals in this game standing out too, we've opted for his defensive team-mate Elabdellaoui who got 1 goal, 1 assist and a clean sheet in this game, while Guilherme is a gold, we feel with lack of defenders standing out may help here, 1 will get in we'd imagine though. Mason Mount - CAM - OVR 74 Mount looks set for an IF after his hat-trick from midfield helped Derby win, looks set for the 2nd EFL IF this week. Leonardo Ulloa - ST- OVR 73 The former Leicester forward now plays in Mexico for Pachuca won 9-2, Cardona got 1 goal and 3 assists in the game, who deserves the nod too, but we've opted for Ulloa for 3 goals and 1 assist, in before both get in. German Cano- ST - OVR 72 Cano joins the hat-trick club with him bagging an assist too, has played a part in all 4 goals for Medellin as they won 4-0, sealing his spot in the TOTW. Milan Duric - ST - OVR 68 Duric looks set for his spot after a hat-trick too for Salerno, while potential others to get the nod ahead of him like Hinterseer for a hat-trick or Richter for 2 goals for Augsburg, we feel Duric gets the nod as a result.